No matter how you slice it, owning a dog is work, but if you’re up for the challenge, a furry friend can enhance your life in ways you didn’t even think were possible. While you may have the greatest admiration for your pet, your neighbors may not. If you’re going to be a dog owner, you have to be a conscientious one. Make sure you’re doing your due diligence by instituting behavioral techniques and proper pooch etiquette at home and on the go. ● Crate training: This helps with house/potty training in younger dogs so you can establish rules from day one. ● Leash training: Due to leash laws, every dog needs to learn how to be leashed, so start with basic walking skills. For example, a loose leash gives your dog the freedom to walk and explore without pulling or tugging, which is great for you, too. It’s also important to teach your dog how to interact with other passing dogs and humans without jumping or getting too excited. ● Agility training: This method of obedience is great for both you and your dog. Since you’ll be helping your furry friend through the agility courses, you’ll be building trust while strengthening verbal and communication skills. The two of you will stay in shape, too! Added benefits for your dog include fulfilling natural instincts and learning problem-solving skills. ● Keep up with your dog’s vaccinations. ● Get your pooch microchipped but at the very least, make sure he has updated ID tags. ● Clean up any waste immediately. ● Monitor your dog’s behavior so he doesn’t get too feisty with other dogs, or vice versa. While maintaining your yard is good for your home’s curb appeal, it will also keep your neighbors happy. Of course, yard awareness includes how your pooch reacts in the space. ● Install a fence: Wooden fences are best because they can be built high enough to prevent your dog from escaping, allow for more privacy, and are generally more attractive than a chain-link fence. ● Clean up waste: This should be a part of your weekly—if not daily—routine in an effort to avoid odor and the spread of dangerous parasites and bacteria. ● Keep your dog from barking: While this can be easier said than done, a perpetually noisy pooch can prompt a surly neighbor to call the police or even animal control. Tiring your dog out and knowing when to take him indoors can help, but training techniques are better for the long term. For instance, don’t yell, be consistent with your techniques, remove/block the motivation that’s causing your pooch to bark, desensitize your dog to the stimulus, and execute the “quiet” command. If all else fails, seek the assistance of a trainer. It’s important to note that depending on age and breed, not all dogs need the same level of obedience training or guidance. Even so, there is likely to be a habit or two that can be improved. A well-behaved dog is one the whole neighborhood will love. Parties, BBQ's, Family and Fun! Those are some of the things that come to your mind when you think about celebrating freedom on 4th of July. But what about your pets? If they could talk… but they can only show you how they feel about fireworks by hiding under the furniture, running around the house or even worse… running away from home! This is a video from Petco made last year. And finally... 4 links with interesting reading. Victoria Stilwell: Dealing with Fireworks Anxiety Cesar Millan: How to Keep Your Dog Safe and At Ease when the Fireworks Start ASPCA: Fourth of July Safety Tips PetMed: Top Ten Fourth of July Safety Tips PetPav: 9 Safety Reminders For Your Pets This 4th of July! 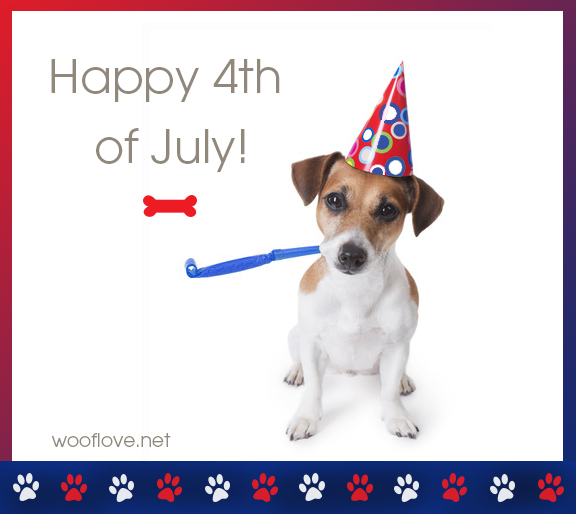 Happy 4th of July from Woof Love! Every day I take Winnie for a walk at the park and I always look around for kids or other people who sometimes approach and try to pet her without asking. Kids come running towards Winnie because they just want to play. She is a sweet dog but we rescued her from an abusive home and even if she is now a happy dog, something inside still makes her fearful of people. She never bites anyone, but I want to prevent that to happen. That's why I found the Yellow Dog Project so great. It is a global movement for parents of dogs who need space. "Yellow Dogs are dogs who need space - they are not necessarily aggressive dogs but more often are dogs who have issues of fear; pain from recent surgery; are a rescue or shelter dog who has not yet had sufficient training or mastered obedience; are in training for work or service; are in service; or other reasons specific to the dog." This movement wants to teach people the best way to approach. You need to always ask the owner if you can pet the dog. You can find resources for training or where to buy gear on this link. You can also just get a yellow ribbon and tie it to your dog's leash. This movement is growing, but many people doesn't know about it yet. Spread the word with your family and friends! and if you have a dog who needs more space… this is a great idea! For more information go to the Yellow Dog Project site. Images in this post are from the Yellow Dog Project page.